The Marines, the Coast Guard, civilian crews and volunteers used helicopters, boats and heavy-duty vehicles Saturday to rescue scores of people trapped by Florence’s shoreline onslaught, even as North Carolina braced for what could be the next stage of the disaster: widespread, catastrophic flooding inland. 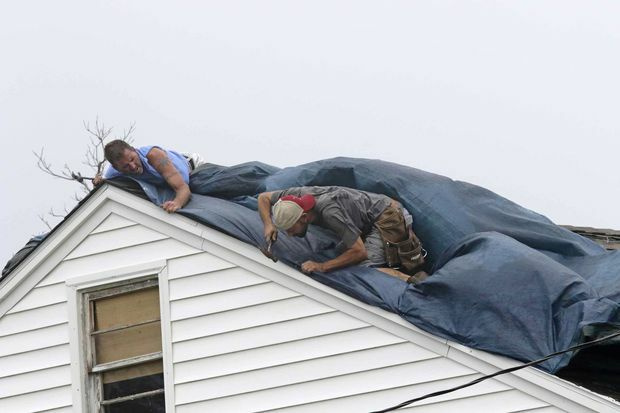 The death toll from the hurricane-turned-tropical storm climbed to eight. A husband and wife died in a Fayetteville, North Carolina house fire on Friday, the state’s Office of the Chief Medical Examiner says. A mother and her 8-month-old child were killed when a massive tree crushed their brick house Friday, according to a tweet from Wilmington, North Carolina police. An 81-year-old man died while trying to evacuate Wayne County, North Carolina, on Friday, the state’s Office of the Chief Medical Examiner says. A 78-year-old man was electrocuted in the rain while trying to connect extension cords for a generator, Lenoir County, North Carolina spokesman Bryan Hanks says. A 77-year old man died after he went outside to check on his hunting dogs and was blown down, Hanks says. 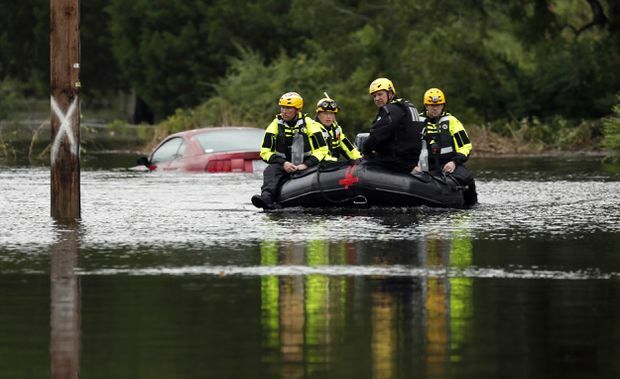 Three people died in Duplin County, North Carolina because of “flash flooding and swift water on roadways,” the Duplin County Sheriff’s Office said on its Facebook page. A 61-year-old woman was killed late Friday when the vehicle she was driving struck a tree near the town of Union, South Carolina, Capt. Kelley Hughes of the South Carolina Highway Patrol said. More than 2 feet of rain had fallen in places, and the drenching went on and on, with forecasters saying there could be an additional 1 1/2 feet by the end of the weekend. As of 5 p.m., Florence was centred about 60 miles (95 kilometres) west of Myrtle Beach, South Carolina, inching west at 2 mph (4 kph) — not even as fast as a person walking. Its winds were down to 45 mph (75 kph). With half of the storm still out over the Atlantic, Florence continued to collect warm ocean water and dump it on land. In its initial onslaught along the coast, Florence buckled buildings, deluged entire communities and knocked out power to more than 900,000 homes and businesses. But the storm was shaping up as a two-part disaster, with the second, delayed stage triggered by rainwater working its way into rivers and streams. The flash flooding could devastate communities and endanger dams, roads and bridge. Officials in nearby Harnett County urged residents of about 1,100 homes to clear out because the Lower Little River was rising toward record levels. 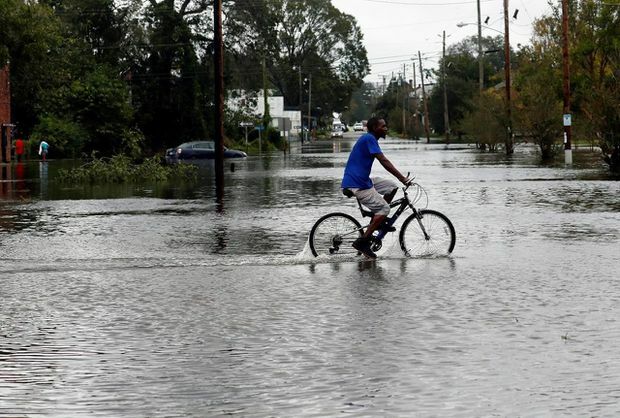 One potential road out was blocked as flooding forced the shutdown of a 16-mile (26-kilometre) stretch of Interstate 95, the main highway along the Eastern Seaboard. 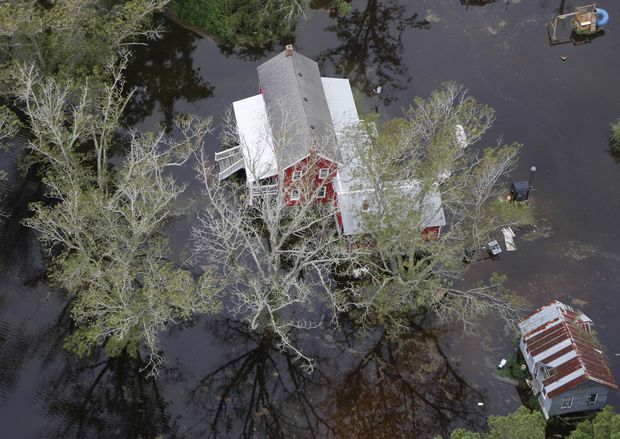 In New Bern , along the coast, homes were completely surrounded by water, and rescuers used inflatable boats to reach people. More than 360 people had been carried to safety since Thursday night. Kevin Knox and his family were rescued from their flooded brick home with the help of Army Sgt. Johan Mackie, part of a team that was using a phone app to locate people in distress. Mackie rode in a boat through a flooded neighbourhood, navigating through trees and past a fencepost to get to the Knox house. Coast Guard helicopters were taking off across the street to rescue stranded people from rooftops and swamped cars. Coast Guard members said that choppers had made about 50 rescues in and around New Bern and Jacksonville as of noon. In Lumberton, about 80 miles inland, Jackie and Quinton Washington watched water filling both their front and back yards near the Lumber River . Hurricane Matthew sent more than 5 feet of water into their home in 2016, and the couple feared Florence would run them out again. “If it goes up to my front step, I have to get out,” Quintin Washington said. The dead included a mother and baby killed when a tree fell on a house in Wilmington, North Carolina. South Carolina recorded its first death from the storm, with officials saying a 61-year-old woman was killed when her car hit a tree that had fallen across a highway. Three died in one inland county, Duplin, because of water on roads and flash floods, the sheriff’s office said. Retired Marine Garland King and his wife, Katherine, evacuated their home in New Bern on Friday and returned on Saturday, sharing a kiss and joining hands as they drew near their house. “It was tough. Wobbling. I was looking for water moccasins to hit me at any time,” he said. They finally made it, and found a soggy, stinking mess. The storm interrupted a September rite in the South: college football. Schools cancelled, postponed, switched sites or changed kickoff times because of Florence. No. 2 Clemson and Georgia Southern had sunny skies and unseasonably mild weather for the only major conference game being played in the Carolinas and Virginia.